Celtic knots started appearing in history after about 450 AD; the Celtic knots meaning is often hard to determine, because there is little written history on their purpose. We can look at the repetition of their appearance throughout history in conjunction with other various human interpretations to give us insight, giving us some basic information relating to the Celtic knots meaning. When viewing these beautiful knots, we cannot see a beginning or the end, reminding us of the timeless nature of our spirit. This translation calls to our most primal selves as we think about the infinite cycles of birth and rebirth in both physical and heavenly realms. A less spiritual representation also relates to the knots endless nature. Because of it's never ending path, the Celtic knot can represent an uninterrupted life cycle. Some may use this symbol as a charm of sorts – warding against sickness or setbacks that might interfere with an otherwise calm and stable life. These knots are often used as emblems, which can be found in jewelry, clothing, or home décor. In ancient times, gifts adorned with mystic knots were given with wishes of longevity, or luck with new endeavors. Irish Claddagh rings have a long history, the roots of which are deeply seeded in Irish tradition. These beautiful rings have become popular all over the world, and are worn by both men and women, single or taken. The Claddagh ring was named for the ancient fisherman's village of Claddagh, near Galway, Ireland, and is believed to be over 300 years old. 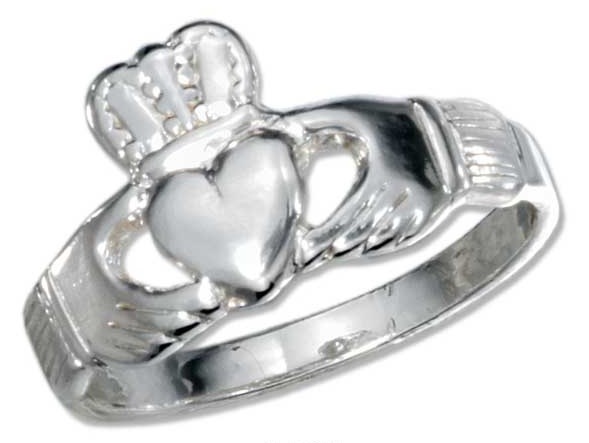 The meaning of the Claddagh goes further than the symbolism represented in the ring itself - the hands clasping the heart adorned with a crown. The meaning also extends to the hand upon which the ring is worn, and the direction the heart is pointing. For a single person, the ring is meant to be worn on the right hand with the point of the heart facing outward, away from the body. For someone who is in a relationship, whose heart is taken, or who isn't interested in a relationship, the ring is meant to be worn on the right hand with the heart pointing inward. For someone who is engaged or married, the ring is meant to be worn on the left ring finger with the heart pointing inward, toward the body. West, representing intuition, emotion, and inner knowledge. 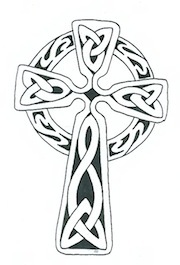 The circle connecting the four arms of the Celtic cross symbolizes the unity and the eternal cycle of life and rebirth. Another interpretation of the Celtic cross is found in the Chi-Rho monogram, a cross made by combining the first two letters of the name of Christ in Greek, Chi (or X), and Rho (or P). The Celtic cross is illustrated by monuments of crosses in Britany, Wales, Scotland, the Isle of Man, Cumbria, Ireland, and Cornwall. 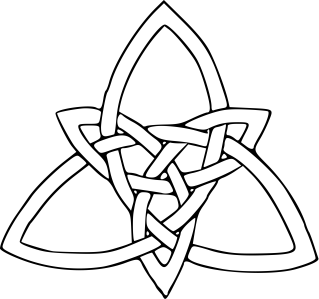 The Celtic Motherhood Knot is a stylized holy trinity knot depicting a parent and child embrace. It is representative of the Madonna and child. Combined with a Celtic trinity knot it is a true testament to the enduring bond between a mother, her child, faith and their Celtic heritage. The Celtic motherhood symbol looks like 2 hearts made out of knot work. One heart is lower than the first heart and both hearts are intertwined in a continuous knot. To add children to the Celtic motherhood symbol, you add dots. 1 dot per child. These dots can be placed anywhere inside or outside the motherhood symbol. 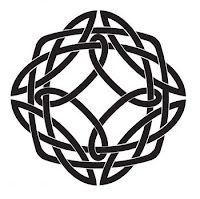 George Bain, a 20th century Scottish Celtic art professor says, Celtic knots that have a closed path, (no end or beginning), are considered to be a symbol of eternity, or represent the infinite. Those with open paths are said to signify a journey (both physical and otherwise). Knot work was performed as a way of displaying heritage. Just like plaids are an identification of clans in the Highlands, certain knots identify certain Celtic families. The difficulty of tracking down the true meaning of your specific knot is compounded by the fact every family could have a unique knot to identify that bloodline, leading to countless different heritage emblems. 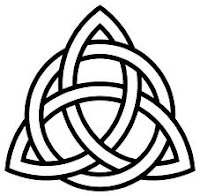 Also tracking down the meaning of one Celtic knot design also depended on the artist. The ancient Celts were very prolific artists...leading to as many interpretations as there were Celtic artisans. An emblem of Brigid also known as the Queen of the Four Fires she demonstrates four branched wisdom of hand hearth head and heart. There are rumors that this design is a four-leaf clover design - a symbol of good luck. There are legends that the four-cornered Celtic knot design was created as a symbol of protection. Celtic meanings surrounding the five-fold motif are fascinating and their significance far-reaching. Specifically, I’m completely enchanted by the fifth element, and how it’s translated by the ancient Celtic mind. The integration in the five-fold symbol is not exclusively Celtic. Almost every culture has the spiritual capacity to observe their world and the universe, having five prime symbolic themes. The first four themes are timeless, honored cornerstones of life found in countless cultures (including Celtic) and they are fairly straightforward. These are joined together by a fifth element. Together, all five designations create a balanced, unified power that, conceivably, can be tapped by the human mind. Druids hinted at an all-encompassing illumination when the five aspects of nature were balanced within human understanding. Early Christian understanding views the symbols as the Father, Son and Holy Spirit. 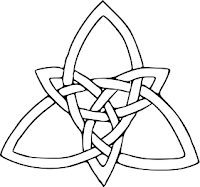 Pagans see the trinity knot as the drawing of the three inherent feminine powers: Mother, Crone, and Maiden. Another understanding can be found in a more metaphysical area where the three corners represent mind, body and spirit. 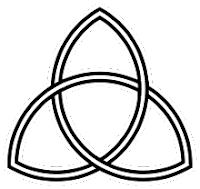 The circle often seen around a triquetra signifies the infinite and eternity. It also represents protection. 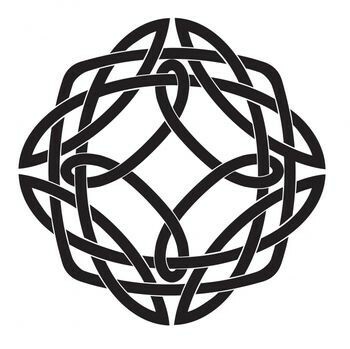 Circles are often drawn around Celtic knots to represent spiritual unity with the devine – a connection that cannot be broken. The name Dara comes from the word "doire," which is the Irish word for "oak tree." The knotwork is likened to that of the root system of the oak tree. Oaks were considered sacred to the Celts, particularly the Druids who could translate the language of trees. The oak in all of its symbolic glory (including other Celtic symbols such as the Dara knot) is invoked in times when we must gather our internal fortitude for the purpose of remaining strong in times of challenge. The Dara knot, as it associates with the oak, can remind us that beneath the surface we have vast inner resources (root system) that can lend us wisdom and stability regardless of the circumstances we see around us. The Celtic knot mandala enables us to see how our decisions have affected our lives, and those lives around us. Further, we are able to visualize how our lives are interconnected with those of our ancestors. The triskelion Celtic symbol meaning deals with competition and man's progress. The Greek term triskelion literally means "three-legged," this sign looks very much like three legs running. 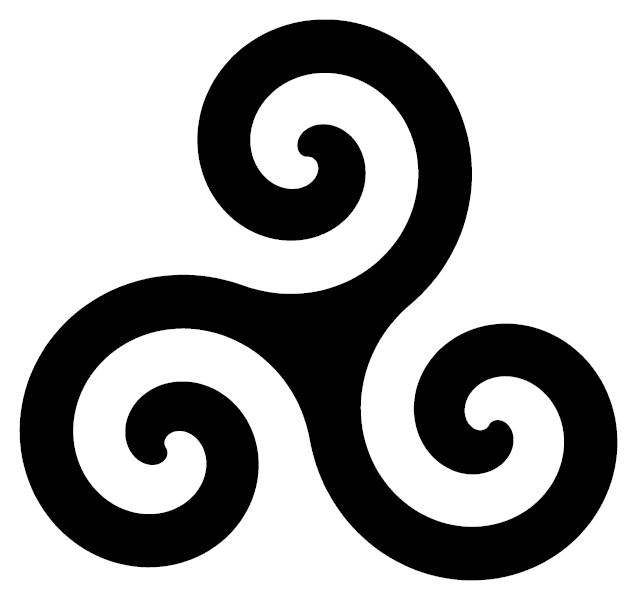 The triskelion, represents actions, cycles, progress, revolution and competition. In all, the triskelion was a representation of a sense of advancement. When we observe this symbol, we are taken with the concept of motion. All three legs are positioned in such a way that makes the symbol look as if it is in constant forward motion. The combination of these two components (motion and triad attributes) tells a story of forward motion in the endeavor to reach understanding. Also the number three is a powerful energy for infinite reasons. One such representation of number three deals with the three primary measure-marks within the phases of the moon (new, half, full). The arwen, also known as the symbol of three rays, was a symbol of the balance between male and female energy. The arwen, with three rays that were parallel to each other, was often used in jewelry. The first and last rays signified the powers of the 'male' and 'female' respectively. The middle ray signified the balance and equality of the other rays. Experts of Celtic symbols and meanings, have interpreted that the arwen is a symbol that implies balance, between two opposing powers in the universe. The single spiral is one of the most common symbols of the Celtic culture. The spiral was actually the figure that had the spiral folds of the same line. This symbol stood for the radiation of ethereal energy. There are however many different meanings of the single spiral. expansion of the consciousness, its perseverance and knowledge. The dual centered spiral Celtic symbol is said to be similar to that of the Chinese ying and yang. It is said to symbolize the positive and the negative sides of nature and therefore promotes balance. 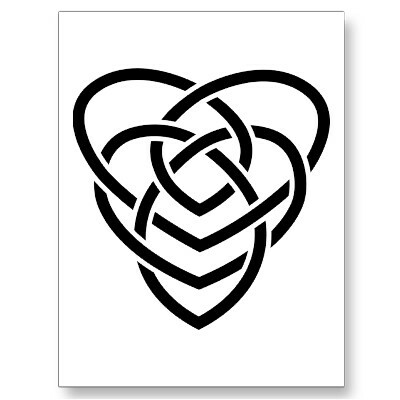 Heart knots are a rather recent addition to Celtic symbolism.